Vector Equations in Space Accelerated Math 3. 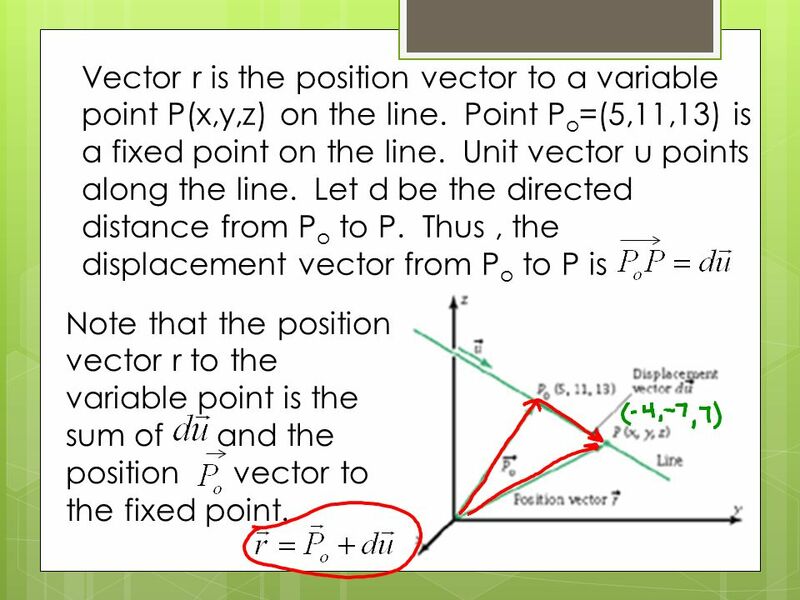 Vector r is the position vector to a variable point P(x,y,z) on the line. Point P o =(5,11,13) is a fixed. 2 Vector r is the position vector to a variable point P(x,y,z) on the line. Point P o =(5,11,13) is a fixed point on the line. 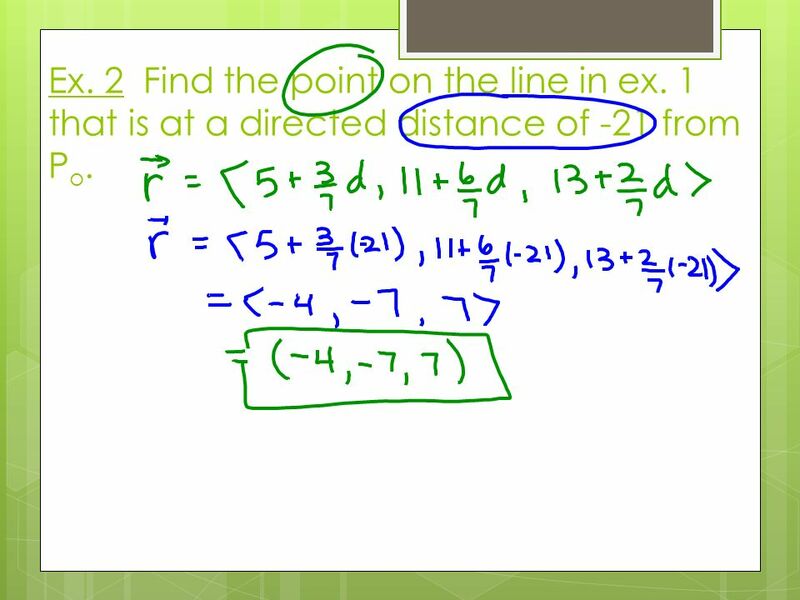 Unit vector u points along the line. Let d be the directed distance from P o to P. Thus, the displacement vector from P o to P is Note that the position vector r to the variable point is the sum of and the position vector to the fixed point. 4 Ex. 2 Find the point on the line in ex. 1 that is at a directed distance of -21 from P o. 5 Ex. 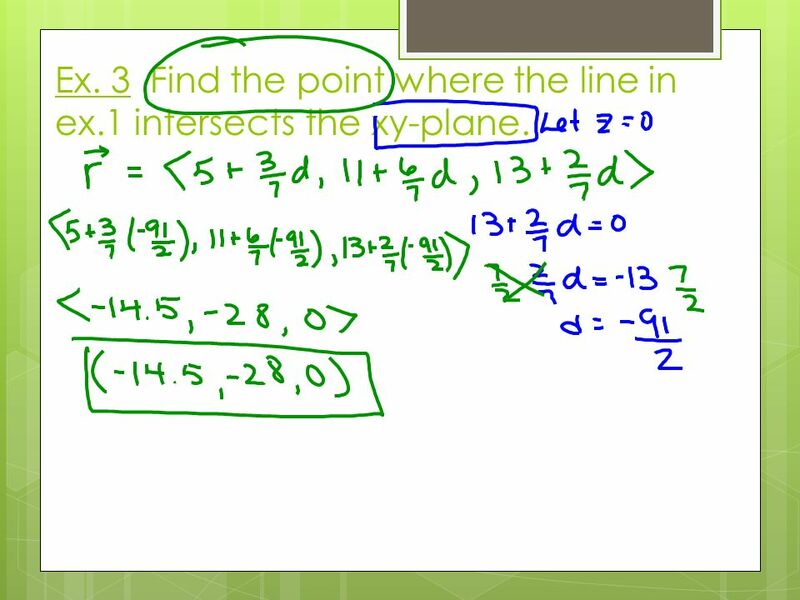 3 Find the point where the line in ex.1 intersects the xy-plane. 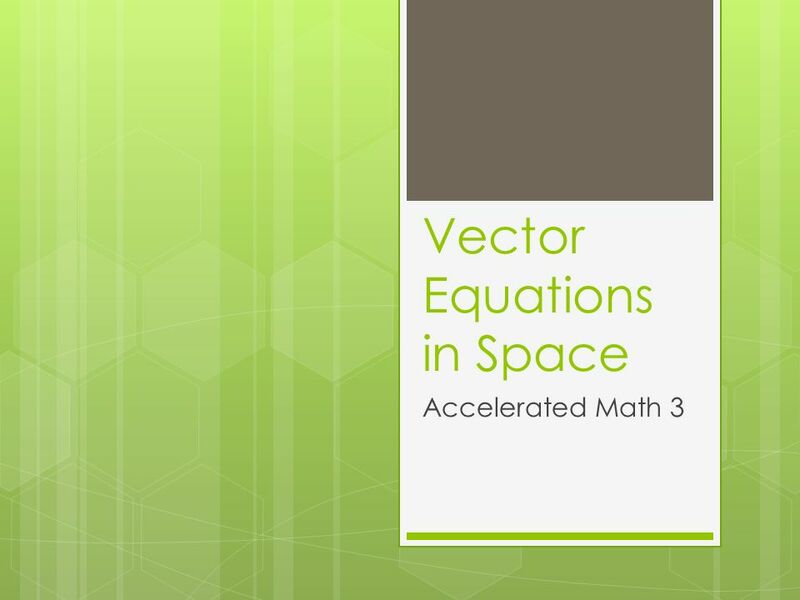 Download ppt "Vector Equations in Space Accelerated Math 3. Vector r is the position vector to a variable point P(x,y,z) on the line. 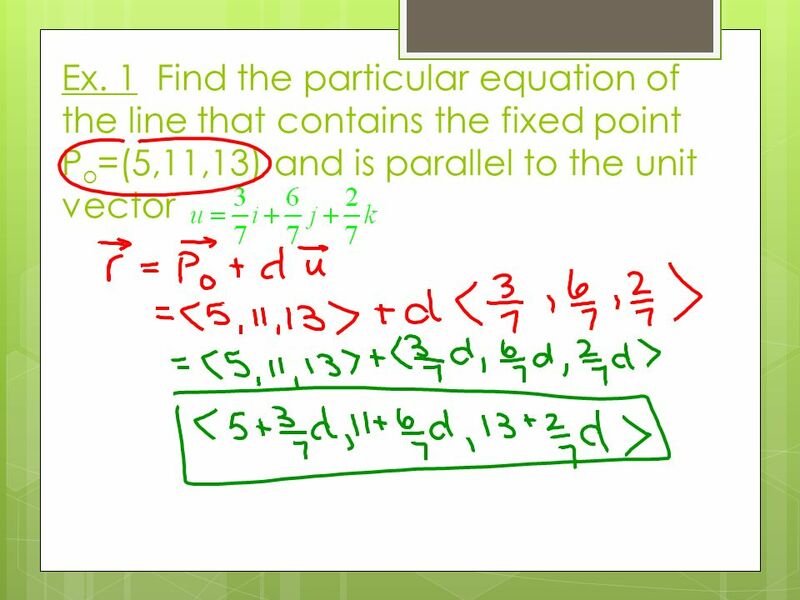 Point P o =(5,11,13) is a fixed." Cross Product Before discussing the second way to “multiply” vectors, we need to talk about matrices… If , then the determinant of A. The gradient as a normal vector. Consider z=f(x,y) and let F(x,y,z) = f(x,y)-z Let P=(x 0,y 0,z 0 ) be a point on the surface of F(x,y,z) Let C be any. MA Day 9 – January 17, 2013 Review: Equations of lines, Section 9.5 Section 9.5 –Planes. T5.3 – Lines in Space IB Math SL1 - Santowski 5/20/20151IB Math SL1 - Santowski. Basic Math Vectors and Scalars Addition/Subtraction of Vectors Unit Vectors Dot Product. Main Menu Salas, Hille, Etgen Calculus: One and Several Variables Copyright 2007 © John Wiley & Sons, Inc. All rights reserved. Lines Vector Parametrizations. Vectors: planes. The plane Normal equation of the plane. 6.4 Vectors and Dot Products The Definition of the Dot Product of Two Vectors The dot product of u = and v = is Ex.’s Find each dot product. Math 71A 3.1 – Systems of Linear Equations in Two Variables 1.
x y no x y yes. Equations of Circles. Vocab Review: Circle The set of all points a fixed distance r from a point (h, k), where r is the radius of the circle and the point.